I had hoped after yesterday that the weather would improve, and while I had clear skies today, the wind was worse than ever. I was up at 05.00 as per usual after another good nights sleep, and was feeling positive about the day ahead. 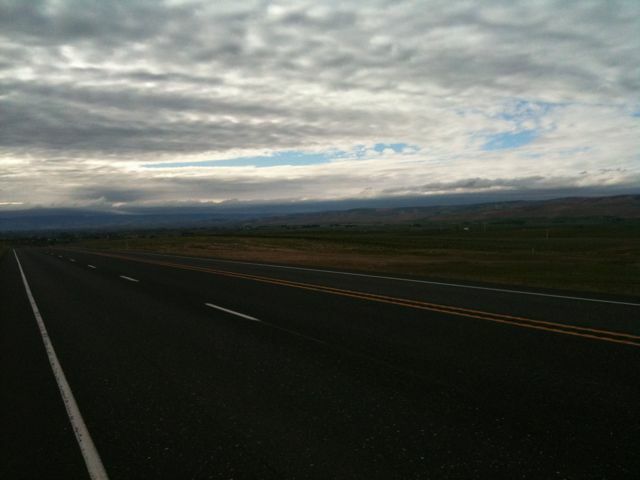 I cycled through the Walla Walla valley this morning, which is apparently famous for wine making and I passed at least a dozen wineries along the way, all largely commercialized and targeted at tourists. The wind made for slow, tough going today – it really drains you physically and mentally. 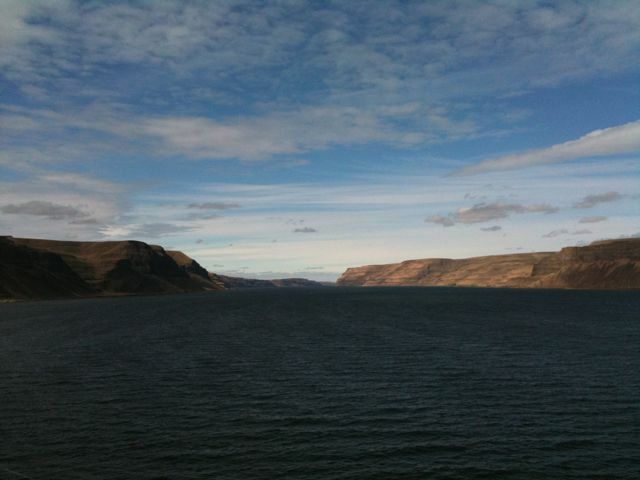 After several hours hard grind, I joined the Columbia river which I’ll be following to the coast. It’s an awesome river, far bigger than I expected, and has carved a deep channel in the landscape which made for a great view. 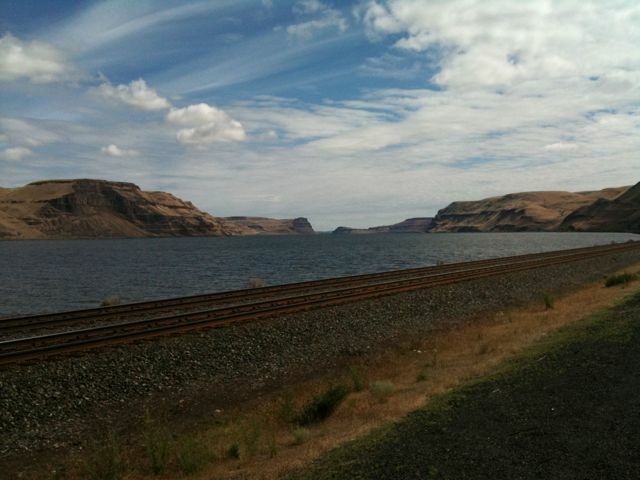 It’s the fourth largest river in the US and has a drainage basin the size of France! 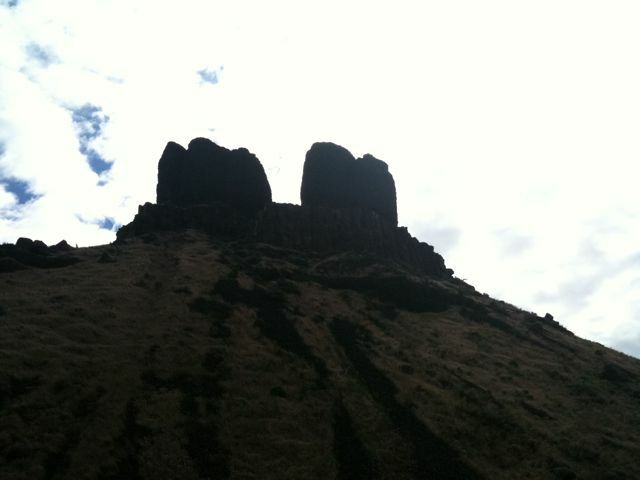 Soon after i’d started to follow the river I crossed the boarder into Oregon – my final state. 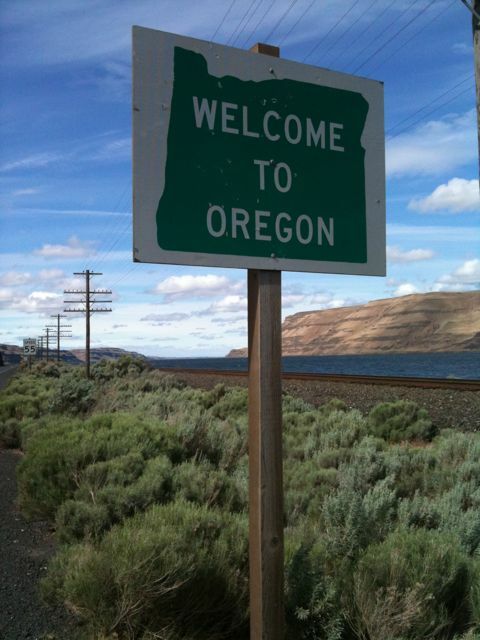 Since I started the trip, when people have asked where I’m going I’ve consistantly replied ‘Oregon’ – now that I’ve arrived I’m going to have to be more specific! After enjoying the moment, I pushed on into the relentless wind, moving slowly but steadly toward the sea. Shortly after I passed two couples about five minutes apart – the first were on their first day and are cycling from the local town of Umatilla to North Dakota. The second couple started in Astoria and are cycling across the north of the country to Bar Harbour, Maine. Both sets were flying with a serious tailwind – one of the guys told me that they’d been able to coast for 70 miles with minimal effort the day before, which did nothing to improve my mood. Throught the day the wind got stronger and stronger, and I it slower as fatigue set in. I got to within 1 mile if my destination, Boardman, when I had my first flat since Virginia – after a hasty repair I finally made it, and was soon ensconced in a motel, enjoying a well earned shower. I think the wind is set to continue for a couple of days – so I’ll just have to dig deep, and bear in mind that I don’t have far to go now. Seems like you’re not going to be let off lightly, and this trip is going to be a challenge right to the end…it might be a nightmare now, but it will just add to your sense of achievement when you reach Astoria. Sorry to hear that you have had to battle against the elements once again! 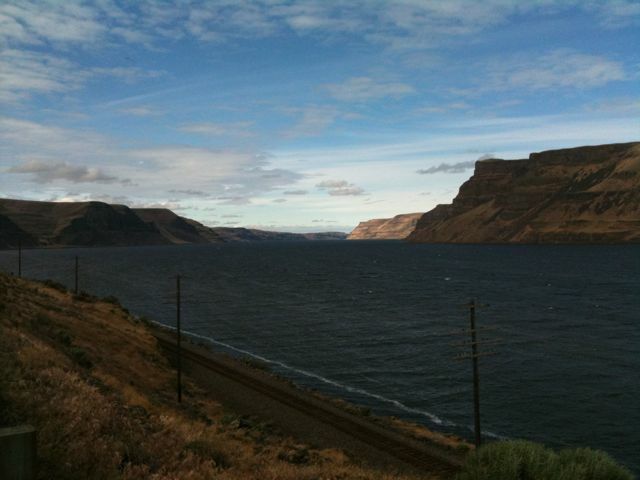 Will be praying that the winds will die down on your final stretch along the Columbia river to the Pacific. I read your blogs every day in wonder of the distances you are covering and the strength of character and determination you are showing. Great photos with wonderful narrative. Not far now – keep going! I hope the wind is not going to be strong for the rest of your journey.You are doing so well and not far to the end.Keep on going Edd you will be at the end soon. I am missing you and I am ticking off the days to when you are back. Go Edd go you can do it.I am thinking of you. Hi Ed.The final state , thats great.hope the wind stops soon. Its very windy at home this w/e but not so bad if you dont have to cycle into it. its really clear, we have been walking on the malverns, fab views. One of my colleagues is just about to cycle lands end to j of g on a tandem. he is really impressed by your achievment. its amazing that you have nearly completed your adventure,you must be so excited to be nearly there. KEep up the good work Ed, your almost there. What an amazing accompishment!!! Some day i will make this amazing journey…till then you are king of the transam!! Dear ED, I met up with your Mum on Saturday 30th June in Odstock and she told me about your trip across amercia, We are thrilled that you did so well and I will send money by a pledge today. Love CATHY AND jiM , AS you know Sharon and I were at school together 40 years ago!! !